Demand response (DR) rapidly grew between 2010 and 2015 in Maryland and serves as a powerful tool used to bolster energy efficiency and conservation efforts in the state. DR allows end-use customers to reduce their energy consumption during periods of high demand (and high prices). Demand response occurs when a customer reduces electricity use in response to either a change in the price of electricity or an incentive payment. Customers that reduce electricity consumption in response to high real-time electricity prices or when called on by the system operator or utility are used as an alternative to generation resources as a means of meeting load requirements. Voluntary usage reductions can come from customers of all sizes. Large industrial customers may choose to shift some high-energy intensity processes to lower-cost hours. Small residential consumers can cycle air conditioning and electric water heaters. When aggregated across thousands of customers, these residential energy use reductions can create significant savings during times of peak demand. Demand response within the PJM Interconnection, LLC (PJM) is utilized as a supply resource in the same way as generators. PJM runs several DR programs that compensate customers for reducing their load. DR resources are eligible to participate in PJM’s energy markets, PJM’s ancillary services markets, and PJM’s capacity market (see Appendix B for a description of these markets). PJM members that act as DR providers are called curtailment service providers (CSPs). Customers can act as their own CSP or sign with another CSP that can bid load reductions into PJM markets. CSPs can participate as a capacity resource in the capacity market and can bid load reductions into the energy markets, both for reductions needed during emergency events or reductions in response to high prices (economic events). 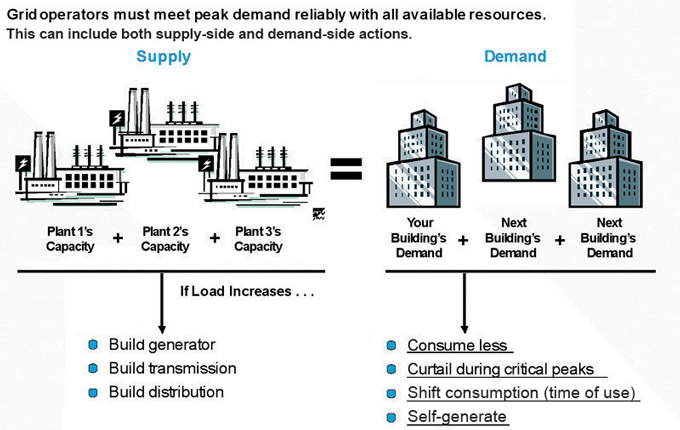 Click to OpenThe Importance of Demand ResponseDemand response resources with adequate response times (i.e., within ten minutes) may bid into PJM’s synchronized (spinning) reserve market, allowing PJM to utilize demand-side resources to respond to unexpected generator outages, unexpected changes in electric demand, or other system contingencies. DR resources are eligible to provide regulation reserves, synchronized reserves, and day-ahead reserves, limited to 33 percent for each category and for two of the three services. DR resources can also provide non-synchronized (non-spinning) and supplemental reserves in PJM. “Limited” wherein customers may only be curtailed ten weekdays between June and September between the hours of 12:00 p.m. and 8:00 p.m. for a maximum of six hours at a time. Click to OpenPolar VortexIn response to poor generator performance during the Polar Vortex in 2014, PJM revised and restructured its capacity market. Approved by the FERC in 2015, the PJM proposal eliminated the three types of DR products and created a single DR resourceCapacity Performance. The purpose of the product is to provide larger capacity payments for performance, including bonuses for over-performing, as well as to increase penalties for non-performers. The revised capacity market went into effect with the most recent auction, the 2018/2019 RPM BRA, where 11,676 MW of Capacity Performance DR was offered, of which 11,084 MW cleared the auction. In March 2011, the FERC issued Order 745 which established that, where it is cost-effective to do so, demand response resources are to be paid the same wholesale price of energy for energy reductions as a generator would be paid for the sale of energy at that same time. Allowing DR to bid into electricity markets and be treated as a dispatchable resource has encouraged the expansion of DR programs and services offered by both investor-owned utilities and competitive CSPs. In the spring of 2012, PJM became the first grid operator to comply with FERC Order 745. On May 22, 2014, in response to a petition filed by the Electric Power Supply Association, the American Public Power Association, and the Edison Electric Institute, the D.C. Circuit Court of Appeals vacated FERC Order 745, finding that FERC overstepped its jurisdiction because states have the jurisdiction to regulate the electric retail market. In January 2016, the Supreme Court of the United States upheld FERC Order 745. The Supreme Court found that although FERC did intentionally impact the retail market; DR is a wholesale function and therefore FERC has the power to regulate the wholesale market even if it has indirect impacts on the retail market. The Supreme Court ruling did not have a significant impact on the PJM market, as PJM continued to conduct auctions. Approved by the FERC in May 2012, PJM offers Price Responsive Demand (PRD) as another class of demand response. PRD applies only to those customers on Advanced Metering Infrastructure (AMI) dynamic rate structures where consumption can vary in response to PJM wholesale market price signals (see Section 5.5.3 for a description of AMI). PRD is an aspect of the smart grid and requires the widespread deployment of advanced meters to retail customers and the introduction of dynamic retail rates. The voluntary participation of PRD providers in PJM’s markets was designed to enhance grid operations and reliability and provide a closer link between the wholesale and retail electricity markets. PJM’s capacity and energy markets would be cleared with the predicted reductions from PRD already included in the supply forecast. This process allows PJM’s operators to better forecast system demand under real-time conditions, as a separate forecast of DR supply becomes less necessary. To date, there has been no participation in PRD. See Chapter 5 for more information on DR and smart grid technologies. MW is equal to 2 million watts, enough power to meet the simultaneous peak demand of about 500 homes. The generating capacity of a power plant is the maximum amount of power it can instantaneously supply to the grid and is measured in megawatts (MW). Electricity generation is the amount of power supplied through time (energy) and is measured in megawatt-hours (MWh). Through a joint venture with Électricité de France (EDF) called Constellation Nuclear Energy Group, Constellation Energy (which merged with Exelon Corporation) owns 50.1 percent of the Calvert Cliffs nuclear facility. GenOn Energy, Inc. merged with NRG Energy, Inc. on December 14, 2012. Demand Response (DR) is a competitive resource that can be used to maintain the balance of supply and demand for grid operations and the associated wholesale markets. Retail electricity consumers tend to be unresponsive to wholesale prices. Therefore, as demand goes up, less efficient generators may be called on to serve higher demand. By reducing demand during these periods, the use of potentially less efficient and more expensive generation resources to meet higher demand can be avoided. The Northeast experienced extended periods of extremely cold temperatures in January 2014. The first event, known as the Polar Vortex, occurred January 6 through 8 and set a PJM winter peak demand record of 141,846 MW, a difference of approximately 35,000 MW from typical winter peak demand. To maintain system reliability, PJM called upon all available generation, as well as demand response resources, and also purchased emergency power. Approximately 25 percent of the demand response capacity responded to the voluntary events. During the Polar Vortex, the real-time Locational Marginal Price (LMP) reached as high as $1,800 per MWh. Not only did the Polar Vortex set the record for highest winter peak demand, the series of storms in January 2014 established eight of the top ten historic winter peak demands in PJM. A second set of winter storms from January 17 through January 29 resulted in natural gas scheduling difficulties. During this second set of winter storms, natural gas generators were forced to operate for a full day to ensure gas deliveries, even if less expensive power was available, causing a significant spike in energy prices. Some retail electricity customers receiving power supply under variable rate arrangements with a competitive retail electric supplier experienced extremely high electric rates during January and February 2014. Several state utility commissions, including the Maryland PSC, opened investigations into the rates charged by certain electric suppliers that received a high number of complaints during the first few months of 2014.